Database backup protection for Microsoft SQL Server as well as Oracle! Complete application backup protection for Microsoft Exchange servers as well as Microsoft SharePoint servers! Cisco UCS Service profile backup protection and granular recovery! Aventis Systems is happy to offer a variety of licenses for Unitrends Backup Enterprise! Both per socket and per server licenses are available in 1, 3, and 5 year license subscriptions. Additionally, all licenses are delivered by Electronic Download for your convenience! 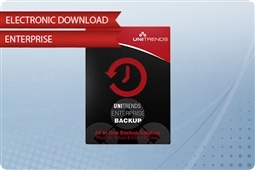 Check out our products below and get the comprehensive all in one backup software for physical and virtual environments as well as enterprise applications today with Unitrends Enterprise Backup Enterprise!